The unique quatix marine watch provides all the features of a navigating handheld conveniently strapped to your wrist. Designed for avid mariners of all types — from fishermen pursuing bass and billfish to canoeists, kayakers, and big sail and power boaters — with a 5 ATM water rating. 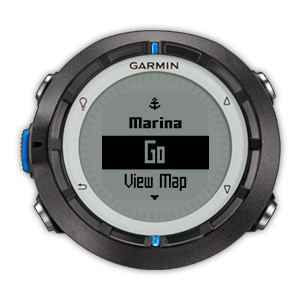 quatix is a high-sensitivity GPS navigator marine watch — the only GPS-enabled device in existence to provide as broad a range of marine navigation features, including remote control of Garmin equipment, such as VIRB action cameras, and streaming NMEA 2000 data to a marine watch. Since quatix is equipped with both ANT® capabilities and Bluetooth® technology, you can easily share tracks, waypoints and routes wirelessly with other compatible Garmin GPS devices and smartphones. You can also plan your trip at home or on a compatible Apple® device with the BlueChart® Mobile app or HomePort™ marine planning software for Windows® and Mac® and download it to quatix. Never before have fishermen been able to have all the information and capabilities that quatix provides, conveniently available on their wrists. You can load routes and waypoints into quatix. Find a hot spot, mark the waypoint and quatix will navigate you right back to that spot in the future. 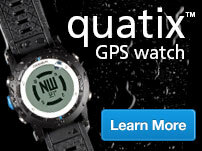 quatix also captures your track and can guide you right back to your starting location. So even if you don’t have a chartplotter on your boat, you can find your way around your favorite fishing spots. In addition, you can use sight and go navigation. Pick a point in the distance you want to navigate to, set quatix, and it will keep you on course. This is especially helpful for kayakers and canoeists. It also has a solar/lunar fishing and hunting calendar so you’ll know the optimum time to fish. But quatix isn’t just for inland fishing. Saltwater fishermen looking for big sportfish will enjoy the special features available to them with quatix. In addition to its navigational features and auto MOB, quatix also can stream NMEA 2000 data to your wrist. When paired with a Garmin GNT™ 10 NMEA transceiver (sold separately), you can wirelessly stream and view NMEA 2000 data, such as depth, speed, water temperature, and more right on your wrist, wherever you are on the boat. The built-in barometer monitors barometric pressure to help you detect changing weather conditions. Tide tables provide the same accurate tide data built into our chartplotters and covers more than 3,400 locations. 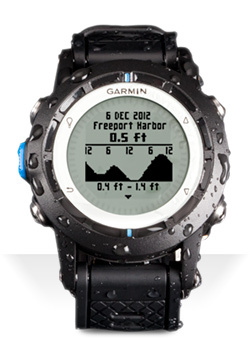 This amazing watch even features built-in remote capabilities. 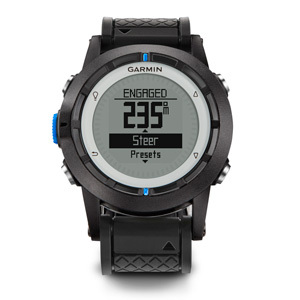 It allows you to remotely control a Garmin autopilot so you can move around the deck while having information and control right there on your wrist. For example, you can engage a figure eight pattern, or other preset pattern, over your favorite wreck to keep you fishing where the action is. With a quatix on your wrist, you can enjoy more control, situational awareness and confidence wherever you are on deck of your boat. Gain a little extra peace of mind with quatix when you or a crewmember are on deck at night or during rough seas. Should you or crew member who is wearing a quatix fall overboard, quatix will automatically send an MOB alert to the Garmin chartplotter (requires GNT™ 10 sold separately). Plus NMEA 2000 data can be wirelessly streamed to quatix when paired with a GNT™ 10. This allows you to view NMEA 2000 data, such as wind speed and direction, water depth and more right on your wrist, wherever you are on the boat. 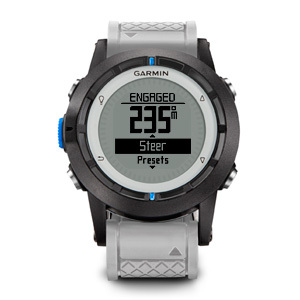 This amazing watch also features built-in remote capabilities that allow you to remotely control a Garmin autopilot. Imagine being free to move around the deck while always having pertinent information and control right there on your wrist. You can actually change course with quatix. Whether you’re sailing in an international regatta or racing dinghies you have a distinct advantage in any sailing race with the special sailing features that quatix puts right on your wrist. In addition to all the other remarkable features available to mariners, quatix offers sailors 3 key features. With Virtual Starting Line you can set up a virtual starting line between 2 marked GPS waypoints, for example a buoy and the committee boat. 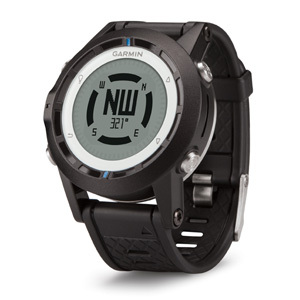 Your quatix will then compute the distance and time between you and that starting line line which you can check with a glance to your wrist. Then, quatix combines the Virtual Starting Line location with a built-in Countdown Timer to calculate both distance to the line as well as desired speed and burn time available. The Countdown Timer, with its large, easy-to-read digits, helps you skipper the vessel to hit the the start line at maximum speed at the exact start time. Once the race is underway, the Tack Assist Mode lets you know whether your vessel is getting headed or lifted based on the optimal tack angle provided. Using Tack Assist can help you enjoy a more efficient and controlled sailing experience. ¹Requires optional GNT™ 10 (sold separately). 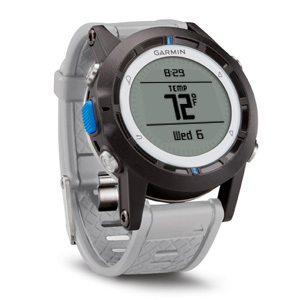 ²Requires optional Garmin Wi-Fi adapter, sold separately. Should a crewmember wearing a quatix fall overboard, quatix will automatically send an MOB alert to the chartplotter (requires GNT™ 10 NMEA Transceiver, sold separately). Wirelessly stream and view NMEA 2000 data, such as wind speed and direction, water depth, and more when paired with a GNT™ 10 (sold separately), wherever you are on the boat. When not at the helm, you have the ability to view time to the next waypoint, final ETA or final distance to your destination, right on your wrist. This amazing watch also features built-in remote capabilities. 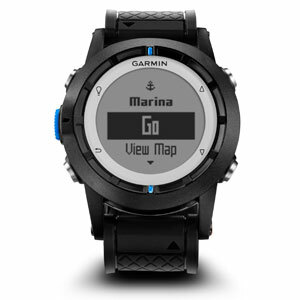 It allows you to remotely control a Garmin autopilot so you can move around the deck of a power boat or sailboat while having information and control right there on your wrist. The built-in barometric altimeter provides accurate elevation information to keep track of ascent and descent. The built-in barometer helps you monitor and predict weather changes by showing you short-term changes in the barometric air pressure. If the barometric pressure begins a steady decline, this could be a warning of an impending storm. Tide tables provide the same accurate tide data built into our chartplotters. Tables cover more than 3,400 locations to help make sure you get to the right place at the right time. The 3-axis electronic compass keeps your bearing whether you're moving or not. Sight a bearing and be confident quatix will keep you headed toward your goal. Mark a virtual starting line between 2 marked GPS waypoints, for example a buoy and the committee boat. Calculates both distance to the line as well as desired speed and burn time available. Shows whether vessel is getting headed or lifted based on the optimal tack angle provided. The built-in temperature sensor keeps track of how rapidly the temperature is rising or falling, helping you determine clothing and shelter needs or whether it might be time to put the boat into land. Easily share tracks, waypoints and routes wirelessly with other compatible Garmin GPS devices and smartphones. quatix is equipped with both ANT® capabilities and Bluetooth® technology. You can also pair quatix with external devices, such as our external temperature sensor, heart rate monitor and speed/cadence bike sensor if you want to use it for physical fitness activities.